Recently, I got my hands on the new Chromebook, a light featured laptop using the Chrome browser as an OS, and a Samsung laptop as its physical frame. While the market is still discussing the end state of HP’s Web OS, now’s a good time to see how other companies are launching their platforms. In particular, the war over eyeballs, desktops, and devices between Microsoft and Google is a long strewn out battle. In Google’s most recent move of Chrombook, they launched an incredibly thin version of an operation systems, Chromebook OS. While I’m not a device guy (I leave that to colleague Chris Silva) I do want to discuss the future of the web, which is most suitable for the Web Strategy blog. In our continued quest to watch the web evolve, let me share with you what I found. First of all, I was surprised when getting the Chrombook and booting it up, I expected to see the Honeycomb OS which I have on a tablet, this one allows for multiple applications, a robust UI, and is deeper in features. 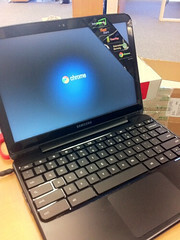 However the Chromebook was well, just as lableled: A browser. If you’re familiar with the Chrome browser that’s really all the device is. You can open multiple windows, and then tabs in each browser, but you can’t install other applications, although plugins are said to be available or coming. Overall, there’s very limited local storage, so most files have to be saved in Google docs. Like most knowledge workers, access to office applications and documents is key, and working my powerpoint files within Google Docs isn’t sufficient (although I’m mainly on the cloud and have created hundreds of Google docs, sheets, and forms through the years). Perhaps one stinging feeling is that it crashed twice within the first two days, despite me doing all the software updates. While the Chromebook (the one I have is from Samsung, which has an ok frame but a lackluster screen) is priced at $429 on Amazon, it feels a bit high as I could get a low end laptop, or a tablet with a bluetooth keyboard for just about the same price. While this device is an important milestone in the evolution of web based operating systems, there’s still a ways to go. There are a few saving graces for the Chromebook: Companies that seek to create online kiosks in their physical stores (hospitality, airports, and airlines like Virgin Air‘s offering of Chromebooks while in flight) can stand to benefit from this very light weight tool. What would satisfy my needs and that of other knowledge workers? A Chromebook that doesn’t cross completely over to a “terminal” browser only system and offers local storage and a handful of office productivity tools that can easily be accessed when offline. I’ve asked our mobile analyst Chris Silva (follow him on Twitter) to jump in the comments, should you want to get his point of view on the future of mobile and devices. The Google Chrome team is responding to me in Google+, (here, here and here) come join the discussion and see other comments. Update: The conversation is also spilling into G+.